There are no many differences between American and European roulette - the main difference is the fact that American roulette has a double zero field on the wheel and the table. The rules are pretty bit the same. So, here is the roulette table - American one. As you can see, you can place even-money bets - on red or black, even or odd, and on the first or the last 18 numbers. Then, you can put your chips on low numbers, 1 - 12, or on middle - 13-24, or on high numbers - 25-36. Of course, you can put your bet on any of 36 numbers, plus zero and, in case of American roulette, on double zero. There are also some combinations - you can bet on two neighbor numbers, or four of them, or the first sixâ€¦ or just the first column, for instance. Playing roulette online is basically the same. You can also choose if you would like to play an American or European version, the rules are the same, although you do have a larger choice of different layouts and some special features. 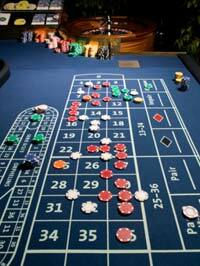 Online you can also find some free games, bonus games or you can play live online roulette.